You may be amazed to learn that there is a lot more that goes into curling your hair than just the technique you use. Other things such as curling iron selection, temperature, and accessories play a big role in that too. These are all things that professional hairstylists know and that’s why when you watch them curl hair they make it seem so effortless. How would you like to be able to curl your hair like that too? Also, check out our picks for the best professional hair curlers! Well, you can if you use the steps that we will go over in this article. Unfortunately, if you were no blessed with naturally curly hair or very wavy hair it may take some doing to get the type of curls you want. It is certainly not impossible though. This is important because it will help you pick out a curling iron with the right barrel size for the look you want. Having the right barrels size is definitely the key to making the size curls you want and how tight they come out looking. 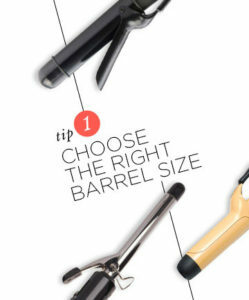 Smaller barrel sizes help create tighter and springier curls for those with medium and short hair lengths. 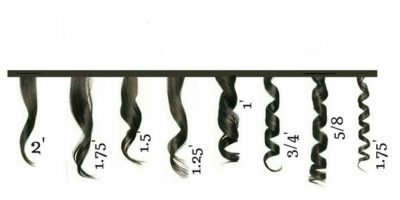 Larger barrel sizes help create loose curls and waves on those with longer hair. Make sure you keep it real here too. If you have short hair you don’t want to use a larger barrel curling iron because your hair will probably not even be long enough to wrap around a thick barrel. Long hair users will not be able in most cases to put tight spirals and springier curls in their hair with any great success. 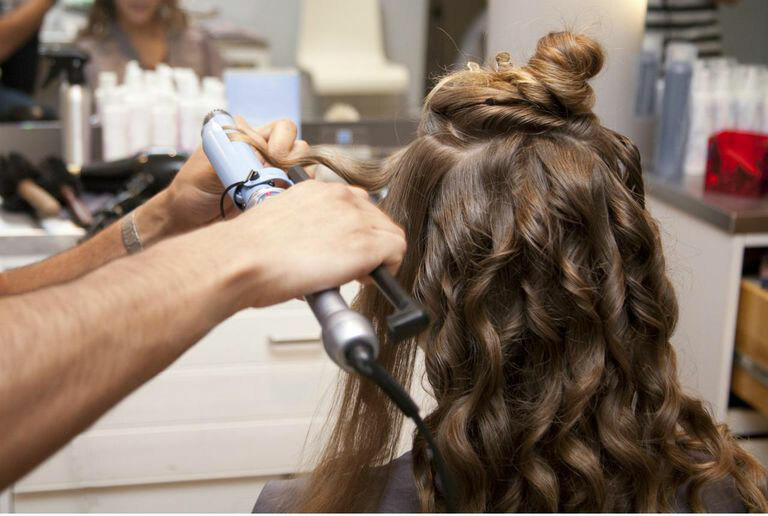 Did you ever wonder why your new curls look so great when you get them done at the salon? One of the big contributing factors is that your stylist knows how important it is to clean, dry and prep your hair the right way. So before curling, wash your hair. Make sure you get it at least 80% – 85% dry and don’t be afraid to add such things as protective oils to keep it from getting heat damage as you curl it. Speaking of heat damage, getting the heat setting on your curling iron right is so important to make it effortless to curl your hair and to keep from damaging. If you have fine or thin hair you should start on the lowest heat setting possible and slowly work your way up to higher settings that will curl your hair nicely without damaging it. If you have thick or coarse hair then you can start at a mid-range setting then work your way up incrementally until a heat setting is reached that curls your hair without damaging it in the process. One thing you don’t want to ever do is throw your new curling iron’s instruction manual in the trash without looking at it. It will give you so much information on what that model curling iron is and isn’t capable of and how to use the key features on it effectively. For example; if your curling iron has a ceramic tourmaline barrel you will be able to use your curling iron at a higher temp without damaging your hair. The importance of knowing your curling iron’s capabilities cannot be emphasized enough during your hair curling process. If you have ever watched your salon professional curling hair, you will notice they curl it in sections. That is exactly what you should do too. This just helps make the curling process less of a challenge. Once your hair has been sectioned start with curling the front, then the back and do the sides last. This will help keep your curls uniform and your look even over your whole head. One of the biggest complaints home curling iron users have is that their curls don’t last long. Many times this is because your hair remains hot for several minutes after it’s curled and that means the strands are still very pliable. Hairs natural weight, wind and even bumping the curls can make them fall out faster than you would like. So pin your curls and let your hair naturally cool before you take the pins out. If you are in a hurry to get out of your house then at least give your hair a good going over with your hair dryer on a no heat setting to cool it off. This is one of the most neglected steps in the hair curling process by those that curl their hair at home. There are reasons they put fancy coatings on your barrel and gunk on it will hurt your curling iron’s performance. After your curling iron cools off, use a special curling iron cleaner on it or at least wipe it off using a clean soft cloth. One thing you should have noticed in these hair curling steps is that many of them having nothing to do with the technique you use to curl your hair. 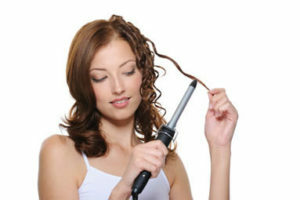 Curling iron selection and hair preparation are just as important to use a curling iron as the technique you use when doing. So start practicing these steps and before you know it you will be getting that ‘just left the salon’ look when you curl your hair yourself at home.